Smart homes have been the nexus of our current world and the future as depicted by science fiction. Automated functions in the house have made life simpler and more exciting. Up until you roll up your driveway on a rainy day and find your automated garage door system with a mind of its own. 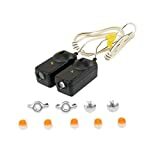 Wireless garage door locks are as old as the internet; and though much has been done to update these devices, there are still issues, such as outdoor connectivity, which has proved to be challenging for most smart house owners. Below are some of the best devices available to you in the 2018 market as a concluded by Protect America, a leading consultancy and home security retailer in the US with over a decade and a half experience in smart home security systems. The Chamberlain MYQ-G0301 is a sleek Wi-Fi powered hub that is not on simple to install but also it can be operated from anywhere as it works with the home Wi-Fi signal. The gadget works with your smartphone; subsequently, it sends notification immediately the doors are opened or closed. 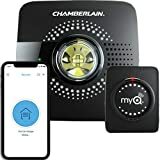 The Chamberlain MYQ-G0301 is compatible with multiple centralized protocols such as Xfinity, Z-Wave, Google Assistant, IFTTT, as well as high-end platforms. Additionally, the device integrates with HomeKit meaning it will include other smart house products such as locks, lights, as well as CCTV systems. Additionally, you can use the Siri app for voice commands. Considering the features explained it is jaw-dropping to find out that the Chamberlain MYQ-G0301 retails for only $80. The Asante Garage is a one of a kind gadget that allows you not only to get a Wi-Fi powered lock that works from anywhere but also it comes with a video camera that can be surveyed through your smartphone. Just before you think the deal can’t get better, well it can, the camera in question is featured with infrared night vision technology. The videos from the camera can be recorded and saved on the cloud app for retrieval at any time of your convince. Similar to the Chamberlain MYQ-G0301 the device sends the user notifications when the doors are opened or closed. The Asante Garage lock with all its features only costs $150, according to a review by Protect America this is the kind of gadget that will guarantee increased security this 2018. Unlike the Asante Garage lock and Chamberlain MYQ-G0301 which are technological marvels, the GarageMate by BlueMate is considered a minimalist smart garage door opener. The device is nifty and can be fitted on any standard garage door wall switch (as long as your house is not 50 years or older). The GarageMate is managed by a smartphone App that allows entry to a number of individuals who are allowed admittance by one admin. This means that not only one person can control the garage; however, not more than 8 may be provided with the privilege. This simple effective gadget goes for under $50 in a market that its competition goes for above double the price. Another special feature of the garage mate is the money back option provided by the company. The Gogogate2 garage kit is a wi-fi powered gadget that has been redeveloped to offer users with new capabilities from its earlier predecessor. The gadget comes with a remote door sensor; a raspberry pi based controller, as well as a temperature gauge that works as a presences antenna. The gadget works by using an app on your smartphone and is compatible with a variety of protocol platforms such as Z-wave; however, it only connects with iOS devices via IFTTT. The GogoGate2 provides its users with customization privileges that include scheduled clip recordings through the IP camera that is provided with the device. The days of clunky garage door openers clipped to your sun visor are coming to an end. If you’re looking to transform your garage into a smart garage, you biggest problem won’t be finding a way to do it, but sifting through all the different options. Grabbing a garage door that includes a camera is a great way to improve your home security. If someone tries to slip in, you’ll know exactly when it happens and what they look like. Another great reason to upgrade, if someone gets locked out of the house without a key, you can simply open the door for them from your smart phone.